If you search on internet, or you want to find an high quality soldering station For phone repairing, there are many kinds of soldering iron from china market, how to choose the right one for your job? it is very important to choose the famous brand, Today, Let's talk about which is a good soldering station for repairing phones? 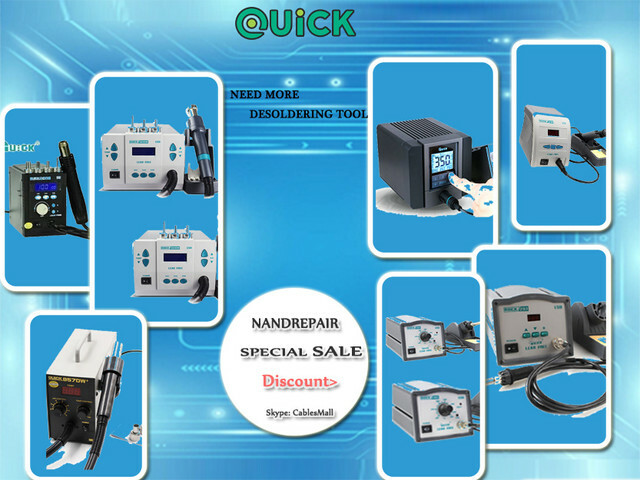 Before you selecting the soldering iron for mobile repairing, it is important to choose the best and high quality tool, which is inexpensive and makes your working more easily and confortable,you have to find from your local market or online shop, such as nandrepair.com-with the good qality phone repair soldering station you will be happy that you had the right tools. It is orginal from QUICK Company- Famous soldering station provider from china. it is one of the largest manufacturer of soldering tools and the related products in China. including soldering stations, rework stations, soldering robots, dispensing robots, BGA rework systems, fume extractors, static eliminators. Quick 861DW Soldering Iron Rework Station is an Professional Digital Soldering Rework Station with 3 Nozzles SMD Rework Station 110V 1000W Lead Free. For more informations, you can check the product no SE020. LEISTO T12-11 phone repair digital intelligent lead-free soldering station with 3pcs Soldering Iron Tip, Mobile phone soldering iron Option AC 220V / 110V input, English language display, professional phone PCB soldering repair tool.